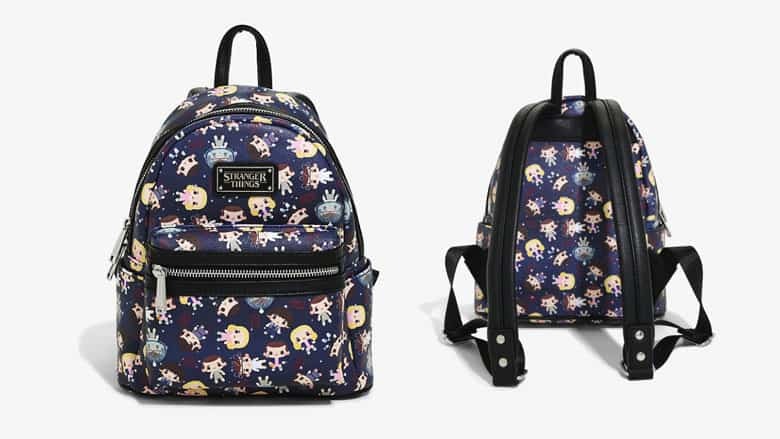 Stranger Things Eleven Mini Backpack by Loungefly | Nerd Much? Anyone who doesn’t love this little backpack is a mouthbreather. Eleven said so! I bought this Loungefly bag that has different versions of Eleven from Stranger Things, one of my favorite shows on Netflix and I am so happy I did! The art is adorable. It has 10 different version of Eleven in her different outfits from the show in a cute chibi anime style. I wish there were 11 different designs, but I guess the number “011” counts, haha. Each of the designs is adorable and should be recognizable to any fan of the show, including a couple versions of her Hawkins Lab outfits including the crazy bubble-helmet. The designs are nice and bright and pop against the dark blue background. They also threw in some of those floating things from the Upside Down to make things nice and Stranger Things-y. The metal tag on the top half of the backpack is super classy. It’s a nice silver color stitched into a black fitting. The zippers work very well, and the two major zipper pockets feel like a good size for the backpack. They feel nice a roomy. There are also small pockets on either side of the backpack, but these don’t have zippers. The straps are amazing, though. They’re super comfortable and carry that premium feel of the rest of the backpack. The two metal studs at the ends of the straps before the adjusting loop also give the whole thing a really fun and punk feel. The backpack is a bit on the smaller side though, but it feels roomy enough when opened, and you are also greeted to the red Stranger Things logo on the fabric inside. I don’t know if it’s a good backpack for kids since the quality is really nice, but if you’re going anywhere on a trip this would be great for carry-ons for sure. Check out more cool nerdy backpacks here.